Turkish Admiral Sought In Failed Coup May Be Seeking Asylum In U.S., Officials Say : The Two-Way Rear Adm. Mustafa Zeki Ugurlu, who had just finished a NATO job in Norfolk, Va., is among the "pro coup fugitives" being pursued by Turkey following last month's failed coup attempt. 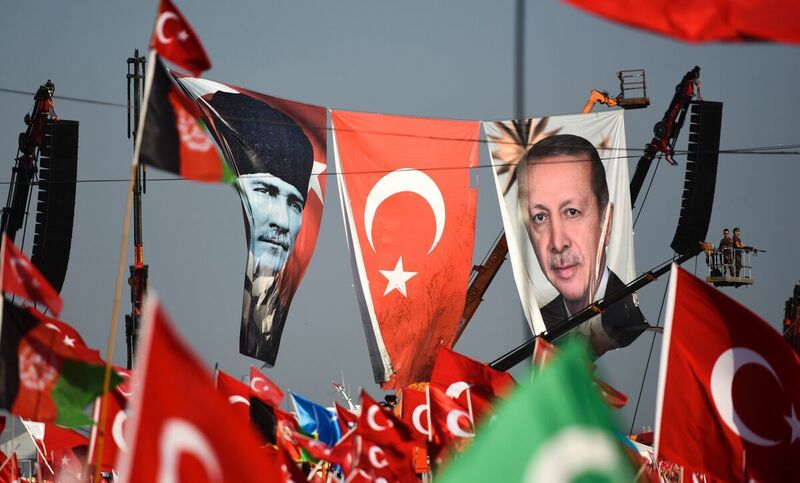 Turkish special force police officers stand guard next to a banner picturing the late Mustafa Kemal Ataturk (left) and Turkish President Recep Tayyip Erdogan as people wave Turkish national flags during a rally this week in Istanbul against the failed July 15 coup. A Turkish admiral who just wrapped up a NATO job in Norfolk, Va., last month is being pursued by Turkish officials, who say he was part of the failed July 15 coup in Turkey. U.S. officials say Rear Adm. Mustafa Zeki Ugurlu is considering seeking asylum in either the U.S. or another NATO country. A spokesman for the U.S. Citizenship and Immigration Services, Steve Blando, said, "We cannot comment on any specific asylum requests." Ugurlu left his military identification at his office in Norfolk, a Turkish Embassy official tells NPR, adding that an arrest warrant has been issued for the admiral. Turkish media, citing government sources, say Ugurlu is among the "pro coup fugitives." The admiral is still in the United States with his immediate family, according to a U.S. official. He also has family back in Turkey. "Rear Admiral Mustafa Zeki Ugurlu rotated from his post at NATO's Allied Command Transformation on Friday (August 5) and his replacement, Rear Admiral Önder Çelebi (Turkish – Navy), will be joining Allied Command Transformation on August 16th, 2016. "Turkey has notified NATO military authorities about the changeover of a number of Turkish military personnel. There has been no impact on the implementation of NATO-led operations and missions and on the work of NATO commands. I would refer you to the Turkish authorities for any further details." For the past year, Ugurlu worked in Norfolk with the NATO training command, where he served as assistant chief of staff, focusing on NATO issues that included command and control and how forces sustain themselves in the field. In that job, he has traveled to other countries for conferences, including Canada. There are several dozen Turkish officers at the NATO command in Norfolk and no one else has requested asylum, U.S. officials said. Scores of generals and admirals have been removed as part of President Recep Tayyip Erdogan's investigation into the failed July 15 coup. Some of those generals worked closely with senior U.S. officers in other NATO commands, officials tell NPR. Erdogan blames an elderly Muslim cleric named Fethullah Gulen — who has lived in self-imposed exile on an estate in the Pocono mountains of Pennsylvania since 1999 — and his followers for the attempted coup. Gulen has denied any involvement. Turkish officials are seeking the extradition of Gulen, and have sent boxes of alleged evidence, a U.S. official tells NPR. So far, that official says, the information doesn't provide any detailed information that Gulen played any role in the coup in which more than 240 people were killed and another 2,200 wounded. Turkey has launched a series of mass purges of suspected Gulen supporters not only in its armed forces, but also in universities, schools, the media and other institutions. U.S. officials worry about the effects of the purges on Turkey's alliances and on its efforts to fight the Islamic State. But even commenting on the purge of generals and admirals can land U.S. officers in hot water with the Turkish government. Last month, Gen. Joe Votel, the top officer at the Special Operations Command, said at a public forum that he was worried about "longer-term" impacts from the failed coup on counterterrorism operations and the U.S relationship with the Turkish military. Those comments drew a sharp rebuke the next day from Erdogan. "Instead of thanking this country which repelled a coup attempt, you take the side of the coup plotters. The putschist is in your country already," Erdogan said, referring to Gulen.